Contents How to make a connection Technical Specification Inch Size Fittings PI Fittings Grey acetal for liquids and inert gases. 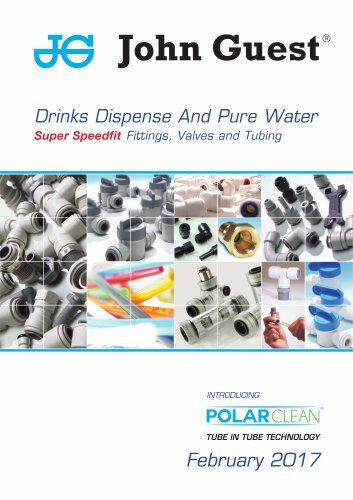 Polarclean Fittings Tube in tube coaxial fittings for draught beer dispense systems. White acetal for pure water and other potable liquids. White polypropylene for pure water and a wide range of applications. Superseal Fittings Grey acetal for use with stainless steel tube. Brass fittings for beverage dispense applications. Metric to Imperial Adaptors Metric to Imperial Adaptors Converts metric sizes to inch and inch sizes to metric. Female Adaptors 5 Thread Forms 10 Thread Sizes BSP Thread -FEMALE ADAPTOR Flat End FEMALE ADAPTOR British Whitworth Thread TAP ADAPTOR BSP Thread FEMALE ADAPTOR UNS Thread TAP ADAPTOR BSP Thread - Flat End FEMALE ADAPTOR Not suitable for air TAP ADAPTOR UNS Thread FEMALE ADAPTOR NPTF Thread BSP Thread -FEMALE ADAPTOR Small Cone End FEMALE ADAPTOR FFL Thread Typically used on beer outlet/gas inlet of keg couplers. Cone supports ‘Top Hat’ type Duck Bill Valve. OFFSET CONNECTOR TUBE STEM COOLING MANIFOLD TUBE OD Intended for use on a 15mm Water Recirculation System. A 4mm restriction between the two 15mm ports directs a proportion of recirculation water around a 3/8” looped spur. Performance characteristics are dependent on a number of variables so it is recommended that suitability is assessed against the customer’s own criteria. CROSS PLUG TUBE OD DISPENSING VALVE ELBOW PM0804S PI0806S PI0808S PM0808S PI0812S PI0816S END STOP DISPENSING VALVE STEM PART NO.